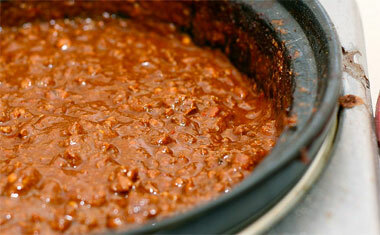 "Texas Red" chili; photo by Jamiepatra on Flickr (non-commercial use permitted with attribution / no derivative works). Texans claim that chili originated in their state, which is hotly contested by New Mexicans. Other rivalries between states involve recipes (of course), but even semantics; New Mexicans use the word "chili" to describe the plant, the pod, and various dishes made with chili peppers, while to Texans, the word "chili" is a very specific culinary dish. RESOLVED by the House of Representatives of the State of Texas, the Senate concurring, That the 65th Legislature in recognition of the fact that the only real "bowl of red" is that prepared by Texans, hereby proclaims chili as the "State Dish of Texas." Texas chili parlor in Austin, Texas; photo by D.B. Blas on Flickr (use permitted with attribution / no derivative works).